The day I make eggplant halwa or kheer, you can give up on me as a basket case and my family can have me committed. Until then, I shall keep on reminiscing about black-soil-grown baingans from the banks of River Krishna, revelling in my discoveries of good quality eggplants in and around Melbourne and enthusiastically cooking eggplant of every shape and size, from different parts of the world and of course, from different regions of India. 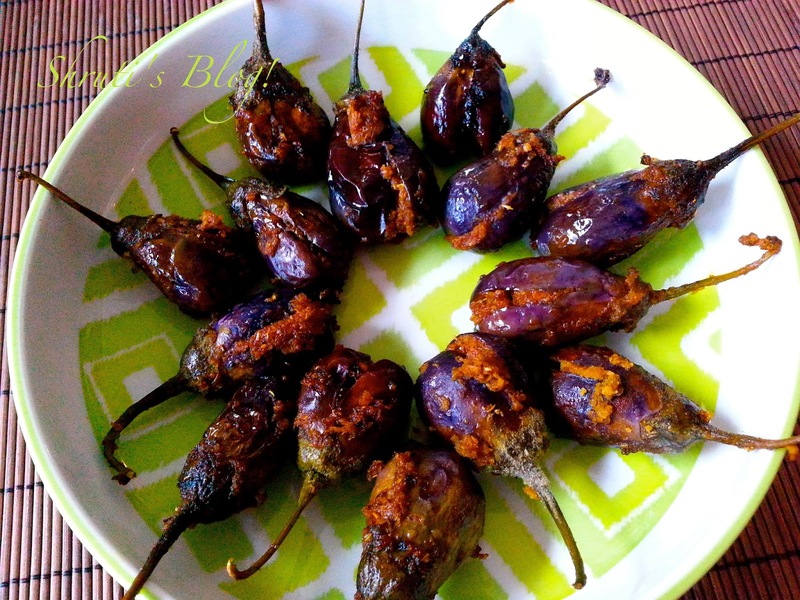 This time it’s Gutti Vankaya, a very popular Andhra recipe of tangy little eggplants. (Gutti is 'cluster' or 'bunch' and 'vankaya is eggplant). However, unlike the gutti vankayas served with pulsu or pappu and hot unpolished rice and the glorious Guntur ghee, they have incarnated as cocktail snacks. A friend's father-in-law was ardently drinking tumbler after tumbler of rasam during her very typically chaste TamBram wedding. As the bride’s bestie, I hung around her all the time and couldn’t help but notice the rather alarming rate at which the distinguished gentleman’s batman was replenishing his steel tumbler. I remember feeling sorry for the Uncle ji that he had missed eating all those delicacies what with the upset tummy. But Uncle ji seemed to be in very good spirits! Well, after all – his son was getting married to such a lovely girl, I had thought. Several decades later when we caught up and were sharing sorrows and salving wounds that certain types of intemperance had inflicted, the tumblers of rasam made sudden sense! My friend was amazed that I remembered, and I was astonished at the ingenuity of the bloody “rasam mary”! Well, I shouldn’t have, I suppose. An uncle of mine was habituated to enjoying his drink on the sly in a house full of elderly Gandhians. He used to pour his scotch into a brass chalice known as a “phulpatra” in Marathi. My grandmother, whose cataract covered hawk eyes missed nothing, had once nonplussed him by peering into his cup and remarking on the muddy quality of the municipal tap water. For days after that, she had pestered him to complain to the council and buy a water filter. Heat 1 tbsp oil in a pan and add the methi seeds, coriander seeds and cumin seeds and red chillies one after the other. Then add the onions and garlic and fry till translucent. Add the hing and haldi. The spices will also get roasted in this time. Remove from heat and allow to cool. Transfer this mixture into a grinder and add the jaggery, tamarind paste, salt and a little water. Grind this into a coarse paste and keep aside. Wash and slit the eggplants from the base to the calyx but not all the way through, leaving them attached at the stems. Keep the stems. Stuff the eggplants with the paste. Save the remaining paste. Heat 2-3 tbsp oil in a flat langadi/ thick bottomed wide and shallow sauce pan. Add mustard seeds and let them splutter then add curry leaves. Remove the pan from the heat for a few minutes while you arrange the stuffed eggplants in the langadi. Add the remaining paste on the top of the eggplants. 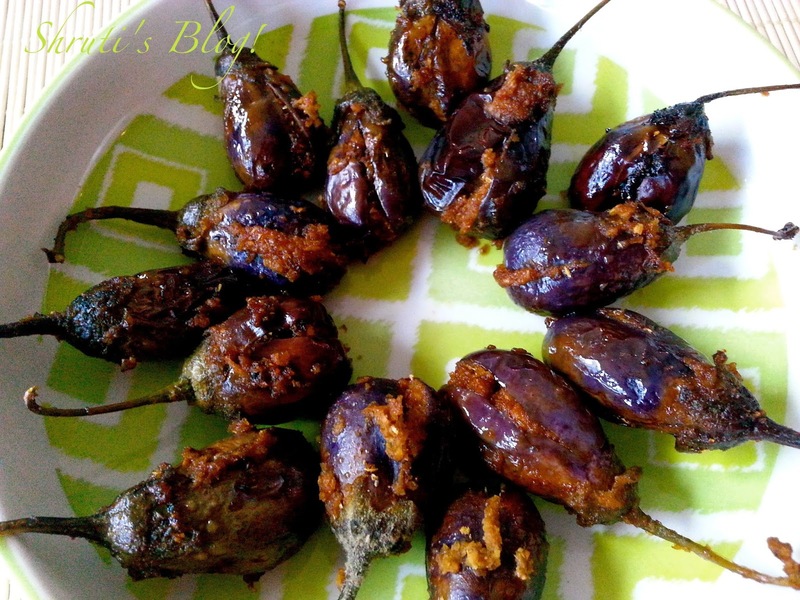 This paste, when cooked may not be presented along with the eggplants if you are going to serve them as a snack, but it surely helps keep the eggplants moist and also prevents them burning. 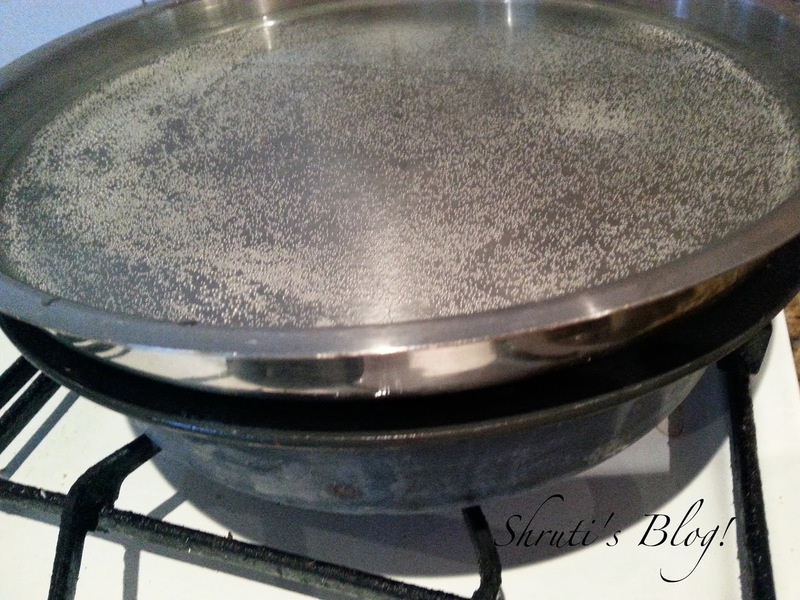 Place a steel plate/thali on the langadi or saucepan and pour half a cup of water in the plate. This is like a “water bath” treatment, popularly known as “panyache zhakan” in Marathi. Cook on low heat for 7-8 minutes. Carefully remove lid (without letting the water splash into the saucepan!). Turn the eggplants once to ensure even cooking. Replace the lid, this time without water for a few more minutes. Check for doneness and switch off the heat. To serve, lift the little eggplant carefully onto a serving tray. And what do you do with the remaining masala. Well, as kids we used to love to mop up the spicy masala dregs from pots and pans with hot rice and would almost fight over who would bag those rights and if we had our way, we would have eaten out of the pans, but for Aai’s dictum that we could eat or drink out of designated crockery and couldn’t fight over food- for these were signs of “daridrya” or destitution. 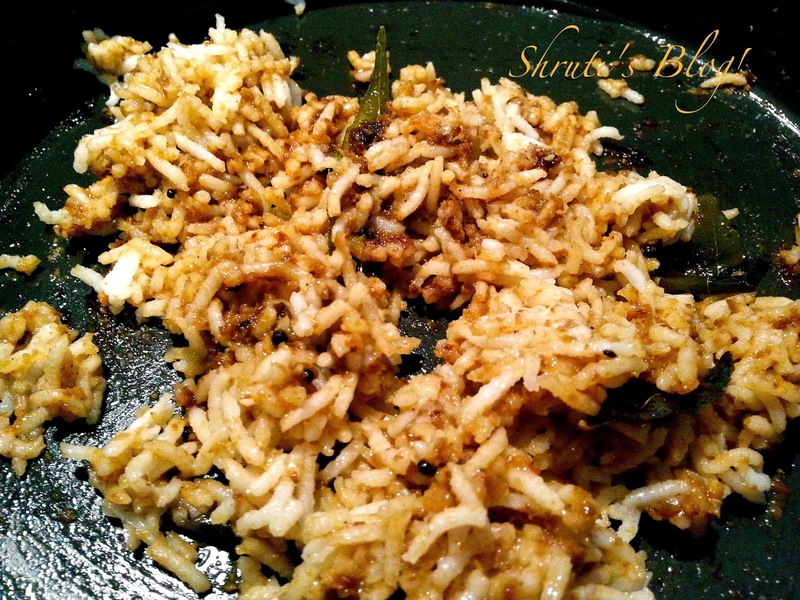 Today, I mopped up the masala with rice and when there were no takers, tucked into the mixture myself. It wasn’t half as enjoyable as the spoils of those squabbles, though!